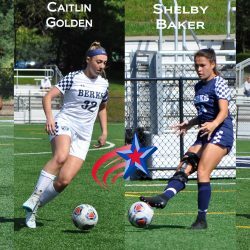 GANSEVOORT, N.Y. – The Penn State Berks women’s soccer team had seven players earn All-NEAC recognition and Caitlin Golden repeated as the NEAC Player of the Year, as voted on by the conference head coaches and announced by the league office on November 1. Golden was also named to the All-NEAC First Team, where she is joined by teammates Alexis Schoener, Charlotte Pizzuto, and Shelby Baker. The trio of Megan Jardine, Karina Raykova, and Bristol Pizzuto were All-Conference Second Team selections. Golden is a four-time All-NEAC First Team selection, to go along with Rookie of the Year (2015) and two-time Player of the Year (2017, 2018) honors. She earns the recognition this year as she leads the country in goals scored (35) and total points (78). The senior forward has also handed out eight assists this season, which ranks tied for third in the NEAC. Golden has scored at least one goal in 13 of 18 contests she played in and has scored two or more goals in 10 contests. She has registered the game-winning goal in six contests, four of which were against NEAC opponents. Schoener earns first team honors after turning in a stellar first season with the Nittany Lions. The freshman midfielder has tallied 12 goals, seven assists, and 31 points this season. She has recorded two game-winners, both coming against NEAC opponents. Schoener has started and appeared in 16 contests this season in the midfield. She has scored at least one goal in six contests and has netted two or more goals in four matches. With her high work rate and soccer IQ, Schoener has done a great job keeping the ball in the offense’s possession or transitioning to defense to thwart opposing teams attacks. Charlotte Pizzuto has been a vital piece of the Nittany Lions midfield to earn All-NEAC First Team honors for the second straight season. The junior’s versatility has helped run the offense and fortify the defense. Pizzuto has recorded three goals, five assists, and 11 total points. She has tallied one game-winning goal this season. Pizzuto, a defensive holding midfielder, is part of a defensive unit that has surrendered only eight goals this season for a 0.44 goals against average and has recorded 14 shutouts. Baker, who was named to the Second Team two years ago and First Team last season, has been the center piece of the Nittany Lions staunch defense. The senior center-back anchors a defensive unit that has that has allowed only eight goals this season and sports a 0.44 goals against average. The defense has recorded 14 shutouts and held opponents to two or fewer shots in a game eight times. Baker has also contributed on the offensive end of the field with three goals, two assists, and eight points. Jardine and Raykova have helped anchor the defensive unit with Baker. In addition to their defensive contributions, the duo have chipped in on the offensive end too. Jardine has netted two goals and is tied for first in the NEAC with nine assists, while Raykova has recorded five goals, seven assists, and 17 total points. Bristol Pizzuto has enjoyed a stellar season in net for the Nittany Lions this season. The sophomore goalkeeper has allowed just eight goals this season – only two against NEAC opponents – and sports a 0.55 goals against average. Pizzuto has recorded five shutouts this season and combined on nine others. She has compiled 51 saves and has an .864 save percentage. Pizzuto has recorded five or more saves on four occasions, including a season-high 10 against then ranked No. 3 TCNJ. The Nittany Lions will face Penn College in the semifinal round of the NEAC Postseason on Saturday, November 3 at 2 p.m. on the campus of Keuka College.